His Eminence Metropolitan Joseph was consecrated to the Holy Episcopacy on June 30, 1991 at the St. Mary Cathedral in Damascus, after many years of serving as a deacon and a priest. His Eminence was born in Damascus, Syria, in 1950. He was consecrated with the title, Bishop of Katana in Syria, and served as Patriarchal Assistant and Secretary of the Holy Synod of Antioch. In 1995, he was sent by Patriarch Ignatius IV of blessed memory to America. Here in our Archdiocese, Bishop Joseph was assigned to the West Coast Chancery by Metropolitan Philip of blessed memory. After self-rule status was awarded to our Archdiocese, Bishop Joseph was enthroned at St. Nicholas Cathedral by Metropolitan Philip as the first Bishop of the Diocese of Los Angeles and the West on September 12, 2004. 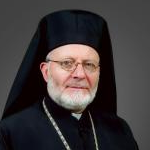 On December 11, 2011, at the Church of the Dormition of the Theotokos in the Patriarchal Monastery of Our Lady of Balamand in Lebanon, Patriarch Ignatius elevated Bishop Joseph to the rank of Archbishop, in honor of his many years of service as a bishop both in our Archdiocese and in the Patriarchate of Antioch. Read the entire article on the Antiochian Archdiocese website. After months of active searching, the Parish Council signed a three-year lease for a permanent location for St. Peter’s. The site is located near the north end of US 41 and Old 41 in a commercial area that is currently undergoing rapid renewal. It should serve our purposes well for the next three years. The site is about 2500 square feet with high ceilings and a loft/balcony in the rear. There is room for Sunday School, a small kitchenette area, two bathrooms, and a handful of other features. As soon as some necessary items are completed (fire inspection, new carpeting, occupancy permits, etc. ), we will move in. We are aiming for August 1 occupancy but depending how how quickly we gain county approval it may be delayed until September, 1. We chose this site after looking at many other properties and even considering buying a plot of land. Rents are expensive, and after considering this property the value simply could not be beat. It’s a good building in a good area. Seventy new chairs have already been donated. We are also replacing the carpeting. More needs will arise as we go along. Our church will be modest (nothing wrong with that) but the standards will be high. Our mission is clear: Grow closer to Christ so that He might be manifested among us, and offer Him to anyone seeking Him within our Orthodox faith. It is our conviction that many people are searching for Him as He is understood and comprehended in our Orthodox faith and if the Lord sees fit to bring them to us, we will welcome them. This is a very exiting journey we have embarked on. My conviction (Fr. Hans) is that we see St. Peter’s grow because it is a place where Christ can be encountered and where the Holy Spirit will work among us. Their sound hath gone forth into all the earth. The heavens show forth the glory of God. Brethren, having been set free from sin, you have become slaves of righteousness. I am speaking in human terms, because of your natural limitations. For just as you once yielded your members to impurity and to greater and greater iniquity, so now yield your members to righteousness for sanctification. When you were slaves of sin, you were free in regard to righteousness. But then what return did you get from the things of which you are now ashamed? The end of those things is death. But now that you have been set free from sin and have become slaves of God, the return you get is sanctification and its end, eternal life. For, the wages of sin is death, but the free gift of God is eternal life in Christ Jesus our Lord.